Rusty Slammington's owner: "I guess Satan just wanted his car back"
Following the Sunday fire that burned celebrated rat rod Rusty Slammington, owner Mike Burroughs posted his account of how the fire started — and how he was trying to keep some perspective on losing a cherished piece of work. I had Rusty torn pretty far down because I was planning on some summer renovations, the main one being a shaved bay. I was also working on a new air management setup so I had the suspension off of the car sitting off to the side. In the middle of all this, I decided to get Ratty's old engine running while it was sitting in the driveway, all out of sheer boredom. I made a new wiring harness for the engine and during the starting process managed to hydro-lock one of the cylinders full of gasoline. I pulled the spark plugs to plunge the gas out, and while turning the engine over, the battery lead hooked up to the harness sparked. The fuel ignited and sent a fireball towards the garage. By sheer chance, the flaming gas landed directly on another 5 gallon tank of gas. The garage more or less exploded. It went up so fast that there was literally no stopping it. Judging by the size of the fire, heat damage has probably rendered the chassis of the car and the wheels structurally unsound. It doesn't really look like much in the garage itself survived, and the garage itself will have to be torn down. I appreciate everyone's kind words so far, but I've already been asked by several people if this is some kind of elaborate scheme to bring the car back again. If you think I'd actually burn my garage down, losing most of everything I own and risking the lives of others in the process, that's pretty sad. At the end of the day, it is technically just a car and I'm glad that everyone is alive and no one was seriously injured. I guess it's on to a new project so I'll be on the hunt for something unique. I guess Satan just wanted his car back. 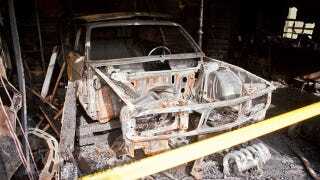 The people Burroughs refers to are the Sherlock Holmes of auto forums who are suspicious of the fire's circumstances, although how someone could collect insurance on a garage they were renting burned by a car with a salvage title is never made clear.